Gabby Foley, host, and Michael Blunt, barista, at the JCC. 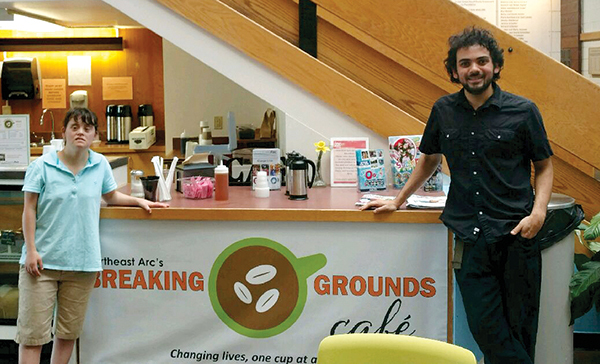 AUGUST 10, 2017 – Northeast Arc, a nonprofit that helps children and adults with disabilities become full participants in the community, has opened Breaking Grounds Café at the Jewish Community Center of the North Shore in Marblehead. Breaking Grounds is a coffee shop in downtown Peabody that trains people with disabilities for careers in the food service and customer service industries. From August 1 to September 8, Breaking Grounds will operate a satellite at the JCCNS, located at 4 Community Road in Marblehead. The café will be open weekdays from 7 to 11 a.m. Breaking Grounds at the Jewish Community Center will offer the same coffee and espresso bar, smoothies, unique soft drinks, pastries, and sweets that customers have come to enjoy at the Peabody location.